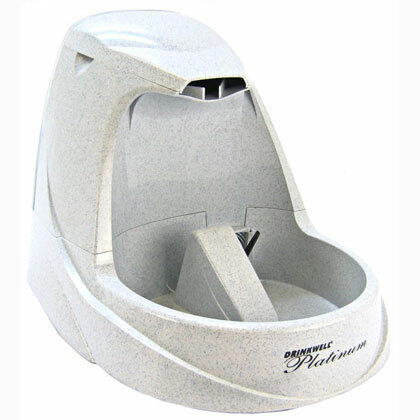 What is Drinkwell Platinum Pet Fountain? Drinkwell Platinum Pet Fountain provides aerated, filtered water to your pet. The patented free-falling stream of water encourages your pet to drink more water, keeping your pet hydrated and improving health. The fountain features enhancements including a large, built-in reservoir, making the total capacity of the unit 1.3 gallons. The submersive pump and specially designed spout reduces operation noise and splashing. A pre-filter blocks large particles and debris from entering the bowl. The Platinum Pet Fountain filters the water with charcoal, which removes bad odors - leading to pure, clean water. NOTE: Also available are the Drinkwell Platinum Pet Fountain Replacement Filters 3pk, as well as the Drinkwell Pet Fountain Cleaning Kit, sold separately. The patented free-falling watering system aerates your pet's water with oxygen and helps to prevent bacteria growth. The appeal of running water will help to ensure your pet drinks more water to stay properly hydrated. The pre-filter blocks large particles and debris. The charcoal filter removes bad odors and particles, providing your pet with clean, good tasting water. Replacement filters and a cleaning kit can be purchased separately to extend the life of the fountain and clean hard-to-reach areas. For indoor use only. Do not operate without water or with a damaged cord or plug. Unplug when not in use and before cleaning. Do not allow pet to chew or swallow parts. Consult your veterinarian if your pet shows signs of allergic reaction to plastic. Supervise when used near children. For detailed instructions, see the Drinkwell Platinum Pet Fountain Manual. Your pet may prefer that the Fountain be placed away from his or her normal feeding area. Try placing it in a separate corner or a different room. Cats may prefer to drink on an elevated area such as a counter. Check the electrical cord for any tears, damage and make sure the inline plug is connected before use. Remove the housing cover (lid) by placing your index fingers into the inset grooves on either side of the lid. Lift up. Set the lid aside. Lift up the reservoir and check to make sure the intake tube is properly inserted into the motor. Rinse the filter under cold water to remove loose charcoal before inserting into fountain. Insert the charcoal filter into the two triangular slots in the center of the housing. The filter fits narrow side down and the black side faces the front of the fountain. The filter will slide easily into place. Place fountain in desired location. If placing on carpet or wood floor, it is recommended to use a protective mat under the fountain. Fill the fountain bowl and the filter housing to prime the pump. Replace the lid and snap into place. Remove the reservoir by lifting up and away from the fountain. Turn the reservoir upside-down and unscrew the reservoir cap. Fill the reservoir with water and screw on the cap. Holding the reservoir upside-down and backwards to the fountain, quickly turn the reservoir right side up and slide into place. Water level will equalize to approximately 1/2 inch below the rim of the bowl. Make sure the cord and your hands are dry before plugging in. Plug the fountain in and set your desired flow rate with the flow control knob, located to the right of the splash ramp. Turn to the far left position for a smaller stream or turn to the far right position for a strong stream. Add water as needed. Do not let the water level fall lower than the flow control knob or you may burn out the motor. Do not pick up a full fountain by the filter housing. Only use the handles located on the bottom of the bowl on either side of the fountain. Cleaning: Lack of cleaning may result in loss of normal function. Use the cleaning kit (sold separately) or wash the fountain and the internal cavity of the motor with soapy water every two weeks. Rinse the fountain parts in hot water weekly. Refer to the manual for detailed cleaning instructions. Filters (sold separately): Filters should be changed every six to eight weeks. Replace filters more frequently when using the fountain for dogs or multiple pets. Filters may be rinsed with water only (do not use soap) when the fountain is cleaned. A small amount of charcoal dust may shed. This is normal and not harmful to your pet. Filters are an added feature of the fountain. Their use is not required for normal operation. Cleaning Kit (sold separately): The cleaning kit includes a 2" diameter brush with a flared tip to clean the fountain corners and edges, a 5/8" diameter brush to clean the intake tube and a 3/8" diameter brush to clean the inside of the motor cavity. It is normal for your pet to be extra cautious when first using the fountain. Allow your pet to adjust at his or her own pace. Some pets take several days or longer to begin use.